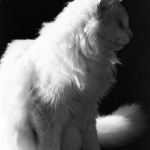 With all the feline artwork I have you can imagine I have a fair number of feline photos as well. You are right. 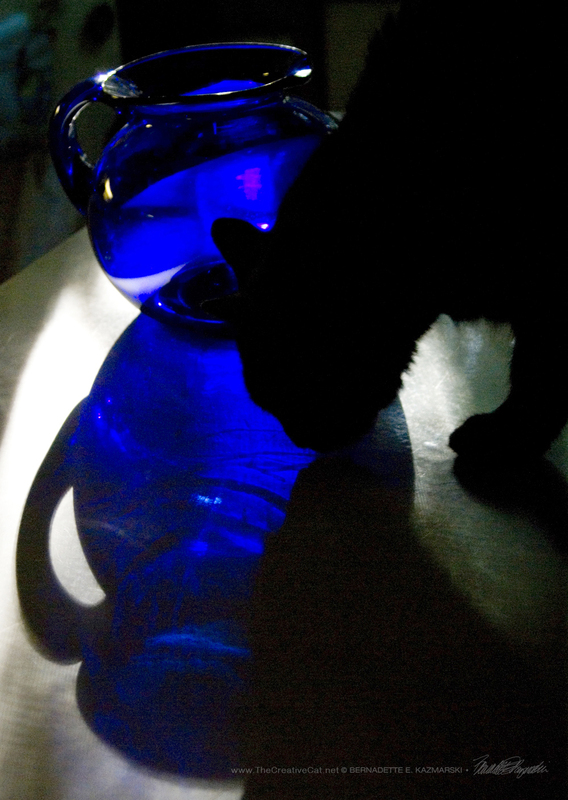 “Blue Pitcher With Black Cat” photo prints are made in archival inks on Epson Silky Photo Paper, Cold Press Digital Giclee Paper or Artist Canvas. I have to say, I do like it, Mr. Sunshine, subtle, almost abstract. I have some talented cats here. I do like the photos that show all the assets of my beautiful cats, but I also like the abstract shots that happen to have a cat in them in a very artful way. 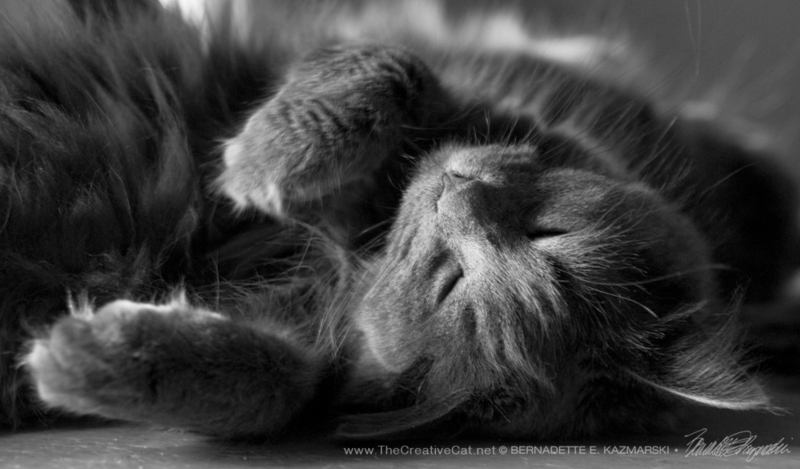 Visit my gallery of Feline Photography. 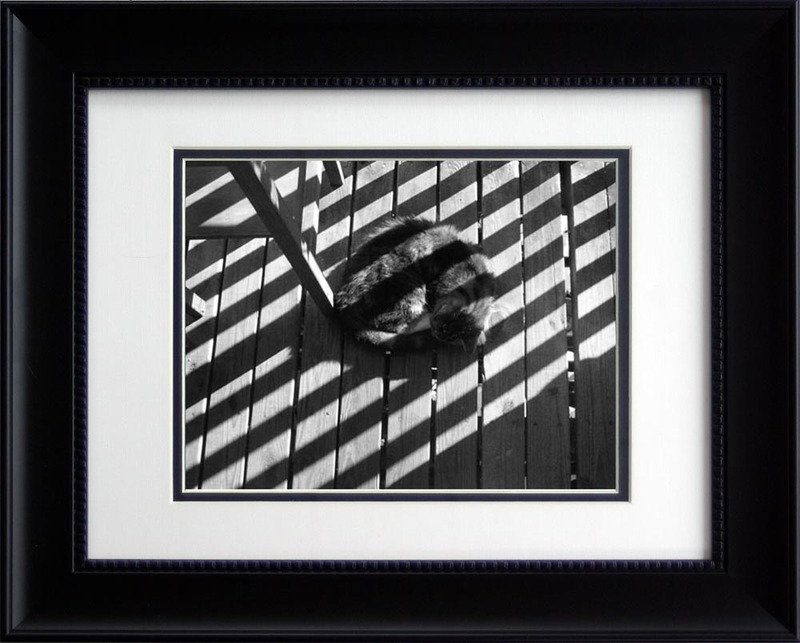 Stripes on Stripe, Feline Photo prints are made in archival inks on Epson Silky Photo Paper, Cold Press Digital Giclee Paper or Artist Canvas and available framed and unframed. 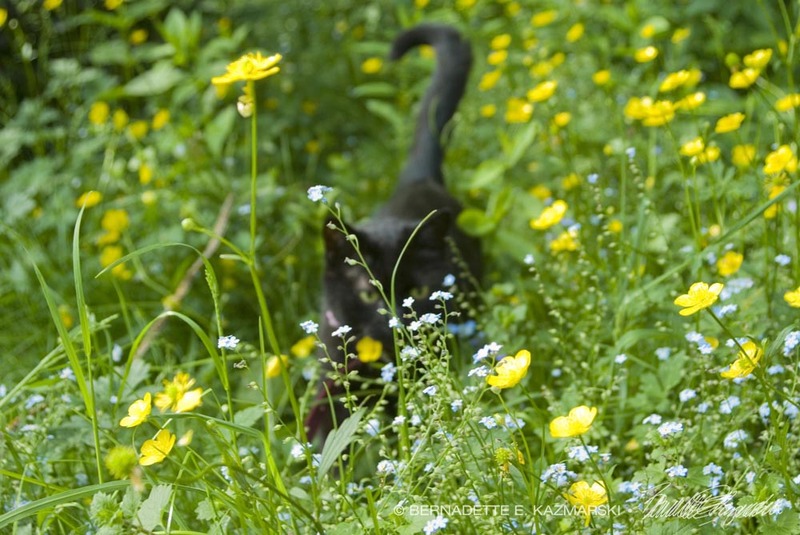 One of my favorite photos of Stanley from August 2006, it was his last summer with me, he was about 24 years old, needing a little supportive care but still enjoying his time outdoors with me and every moment of every day besides that. 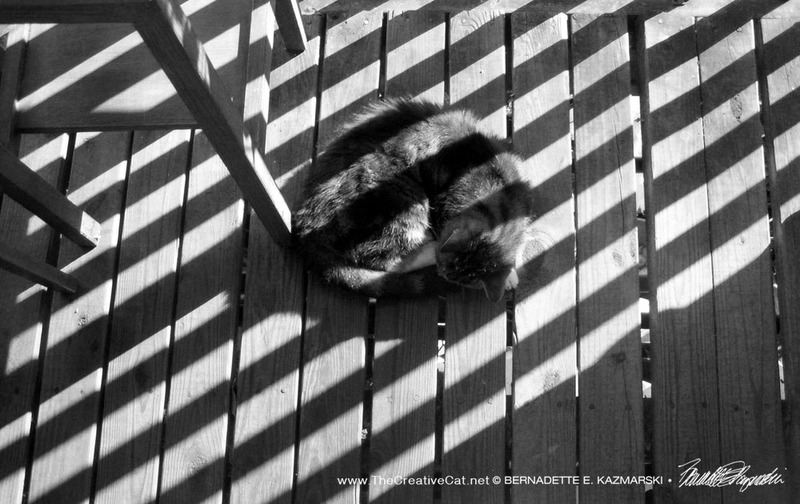 Sunshine and fresh air is a perfect tonic for an old cat. 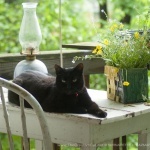 We were keeping the chronic renal failure at bay with doses of subcutaneous fluids, enticing foods, and a morning visit to the back yard and a nap on the deck every day the weather permitted. 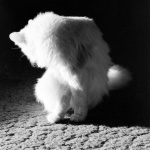 Stanley forgot all about feeling a little queasy and tired as he pranced around the back yard from bush to tree to post, smelling the messages—downloading his “pee-mail” and uploading his reply, as I always called it. Back up on the deck, a little bath and quick nap in the sun, then inside to eat ravenously as if nothing was the matter. I often called Stanley “Stripe” because he was a tabby, and in this photo the confluence of all those stripes was just breathtaking. 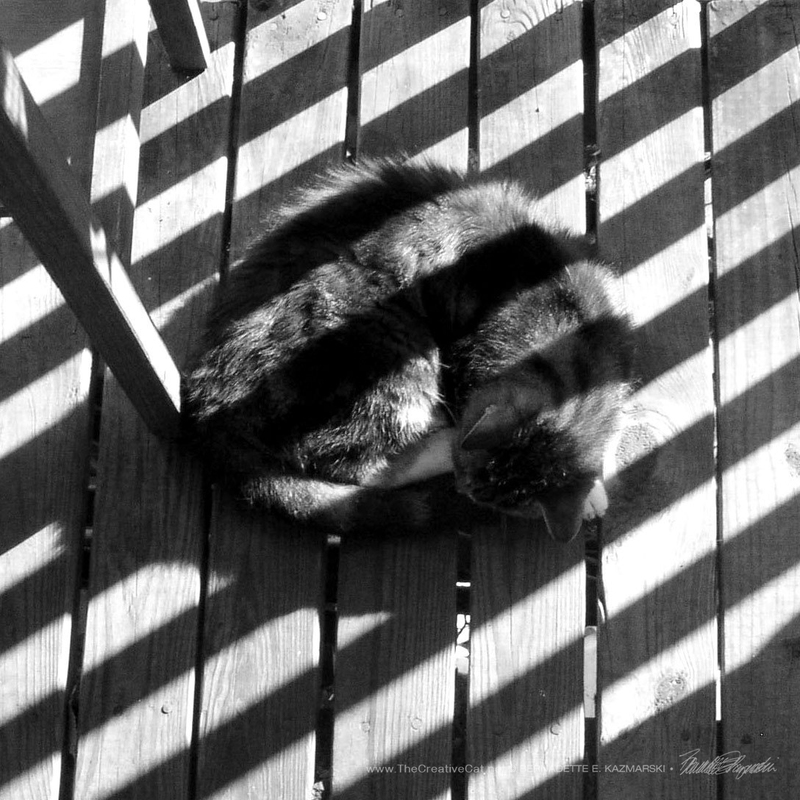 Straight geometric stripes in the shadows from my deck rail coming in at an obtuse and unsettled angle, the deck boards themselves and the gaps between at a normal and comforting angle, and striped Stanley breaking all the straight lines as he curled in a perfect circle for a nap; I could never have posed this or composed this, but what a moment to remember. And if Stanley had not been there I probably would have noticed the shadows as I was working in the garden but not taken the photo, probably busy harvesting green beans or tomatoes, so I have him to thank for this moment. 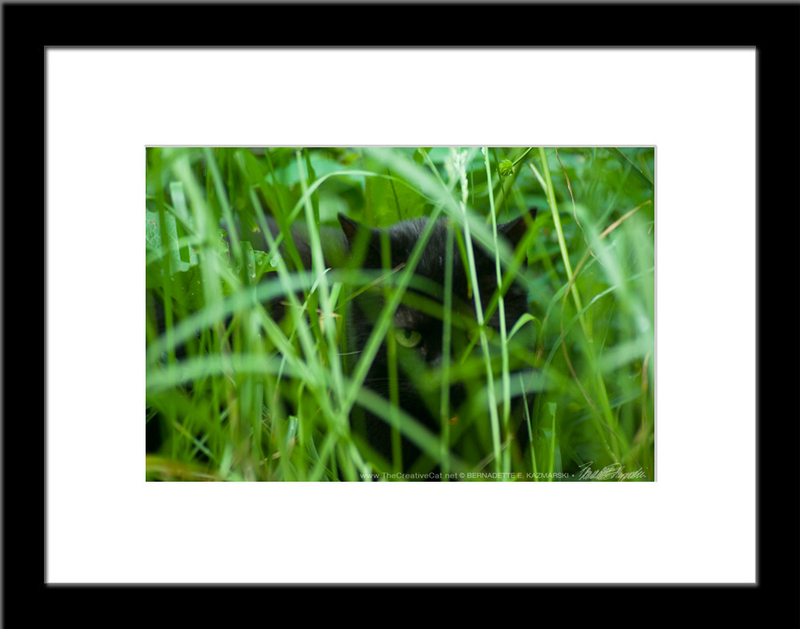 The Eyes Have It, Feline Photo prints are made in archival inks on Epson Silky Photo Paper, Cold Press Digital Giclee Paper or Artist Canvas and available framed and unframed. I took this photo with my smartphone and originally filtered it with my phone and Instagram, but to ensure the print quality I refiltered it in Photoshop. I knew from the moment I took this photo that I’d offer it as a square card. The Eyes Have It square card. 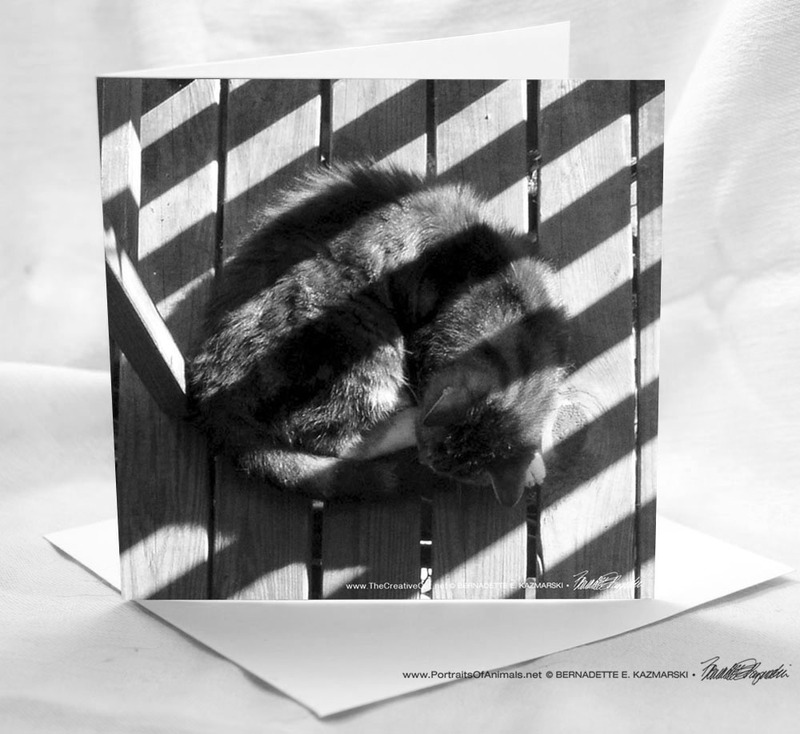 Square greeting cards are printed on 12 pt, matte stock and come with a white envelope. Sets of six and twelve are packed in a clear-top stationery box. Sally Profile, Photo prints are made in archival inks on Epson Silky Photo Paper, Cold Press Digital Giclee Paper or Artist Canvas. This photo was taken with black and white film in 1984, just a year after I’d bought my Pentax K-1000 fully manual camera. 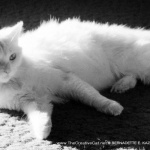 Sally was an Angora-mix cat who was deaf. 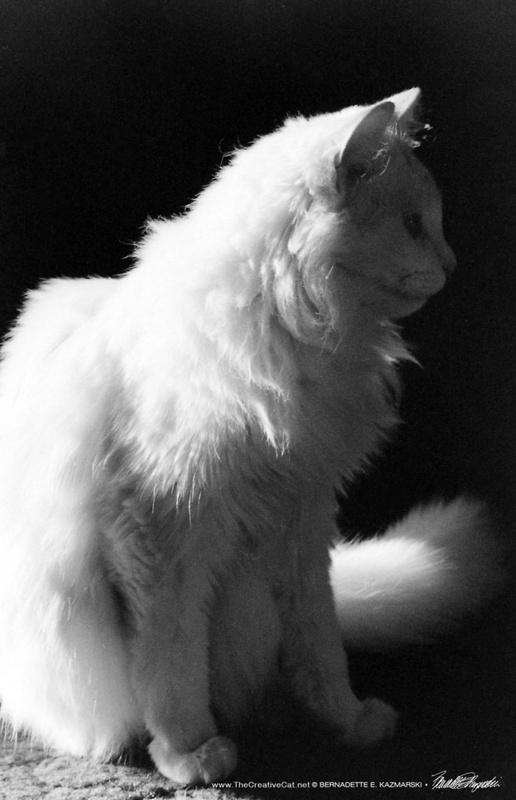 I’d taken her in from a friend who had a hard time handling a spirited and unpredictable deaf cat, and she did eventually calm down somewhat but was always a bit of a wild child. Sally’s deafness may have added to her mystique as a model since she was often so deeply focused on something without the distraction of sound that she could hold perfectly still and I could capture an immense amount of detail, even as a total amateur. At the time I took these photos I had little understanding of what I was doing. That’s okay, we all begin somewhere. 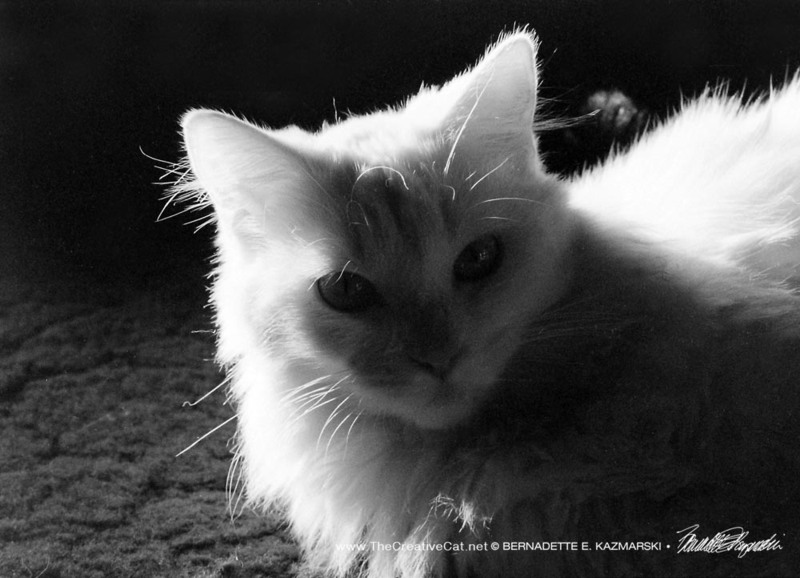 I continued on with this photo shoot, seeing the interesting difference in texture between her fur and that awful olive green sculptured carpet, much improved in contrasty black and white, and the unintended nearly solid black background. The prints have been missing for a while—I find them among a stack of reference photos, then I lose that folder, etc. 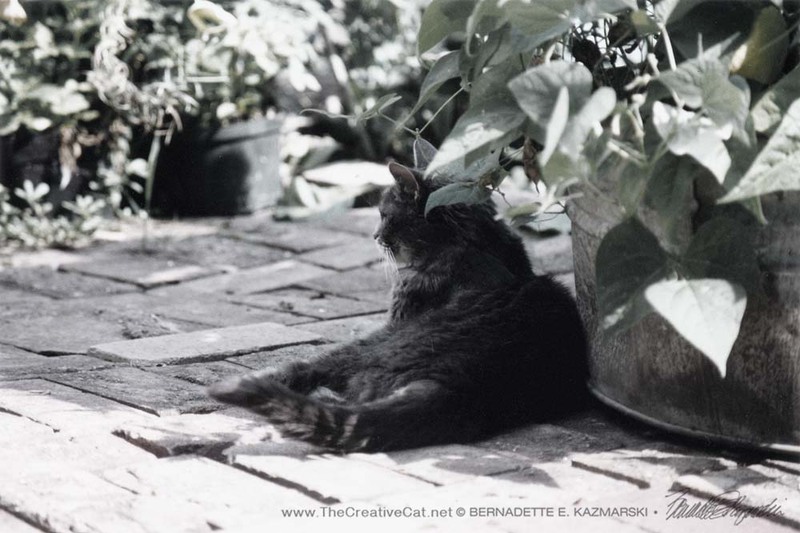 —and now that I’ve scanned the negatives I have them all digitized. 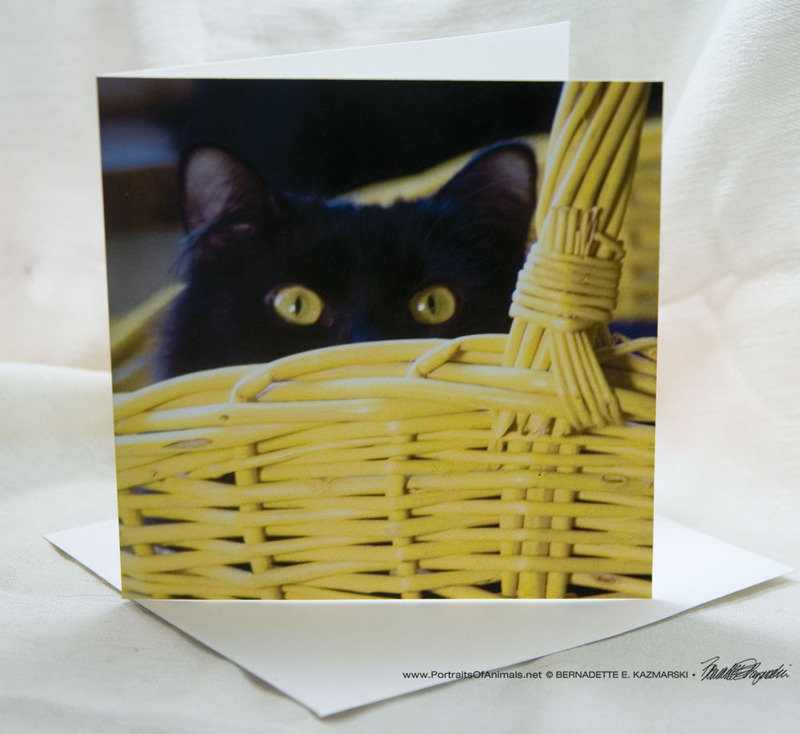 Greeting cards are printed on 12 pt, stock and come with a choice of envelopes. This design comes with a square 5″ x 5″ option. 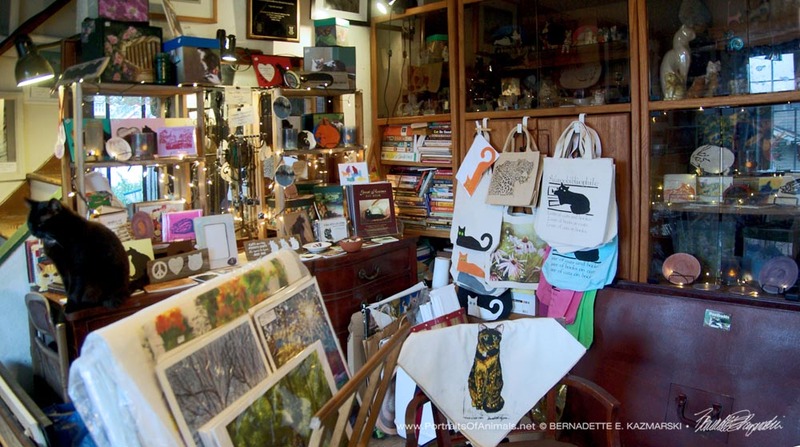 Remember that square cards have a 21-cent surcharge in addition to first-class postage. But they’re so cool. 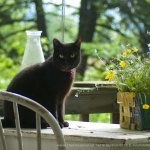 Kelly in Forget-me-nots, Feline Photo, Feline Photo prints are made in archival inks on Epson Silky Photo Paper, Cold Press Digital Giclee Paper or Artist Canvas and available framed and unframed. Kelly had been stepping out into the back yard with me now and then, even asking at the door to go out. 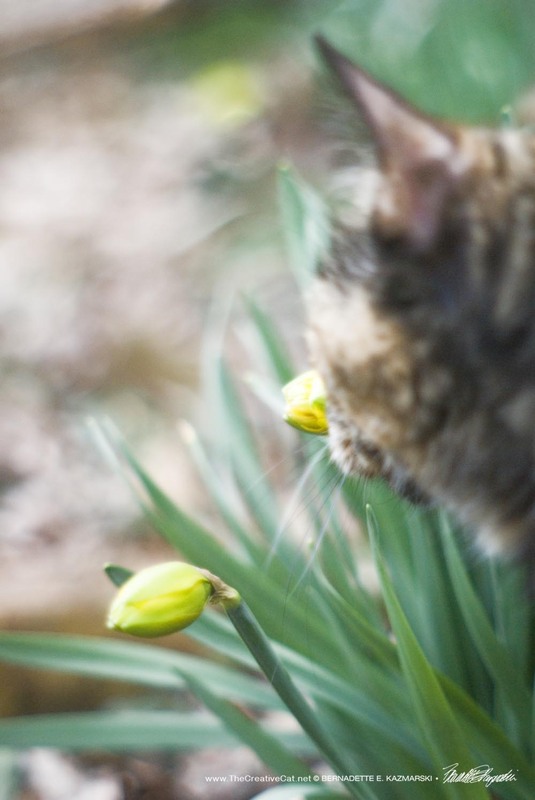 She’d never shown any interest in the 15 years she’d been with me until the spring we lost Cookie, and I couldn’t help but think she associated the outdoors, and the spring forget-me-nots, with Cookie, as I did. 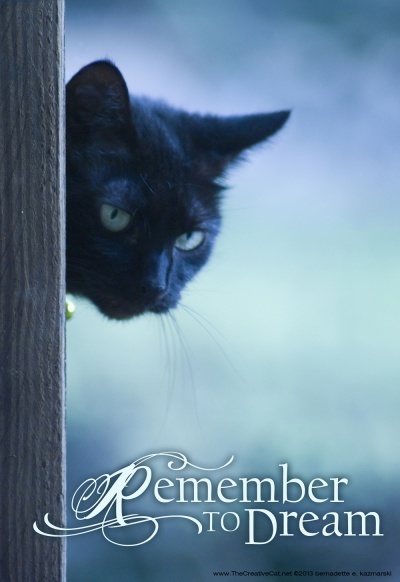 Kelly was now the lone senior cat, and she was very lonely without an older kitty to cuddle with and protect her; she was a little intimidated by the gregarious black cats. This is a kind of an odd angle—I had my zoom lens as I’d been photographing details of forget-me-nots and buttercups together and the cranesbill geraniums and columbines with raindrops from last night’s storms. Kelly’s a little foreshortened, but it’s a good view of her face and those brilliant green eyes; even without the reflection of lush vegetation, Kelly’s eyes are like gems, though the reflected greenness is giving them an extra touch here. It’s hard to believe she was 19 that year because she was still active, lithe and graceful, and because she was the youngest for 11 years I still thought of her as the little one. 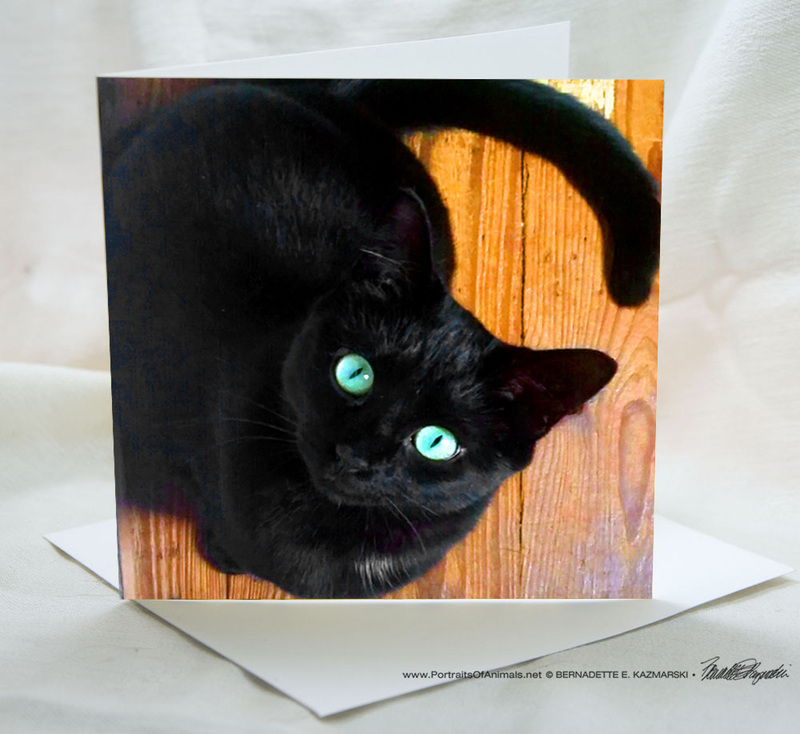 Appreciating Black Cats, Feline Photo prints are made in archival inks on Epson Silky Photo Paper, Cold Press Digital Giclee Paper or Artist Canvas and available framed and unframed. 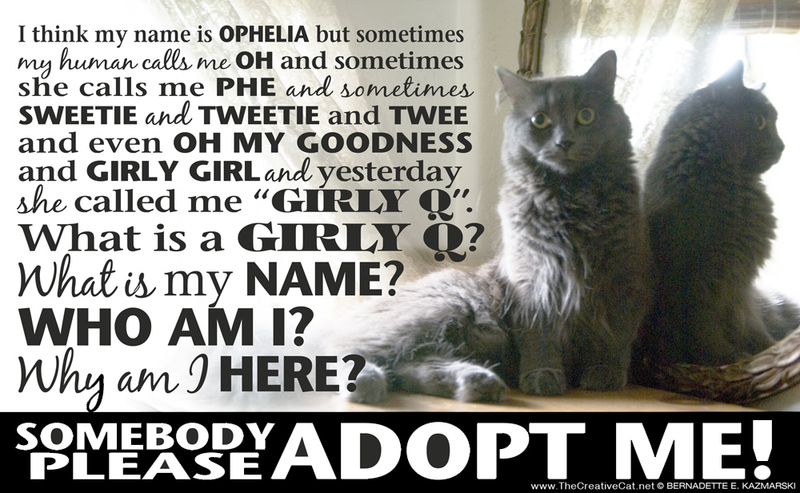 Hamlet and his sister Ophelia were rather feral kittens, did not socialize to fosters, and were placed in a barn to live as feral cats. That didn’t suit them either, so they came to me. It took a while for them to find their socialized selves, and I am more than happy to have gotten to know them and help them to realize humans were nice things, and to be able to have them as my muses and models for a couple of years. 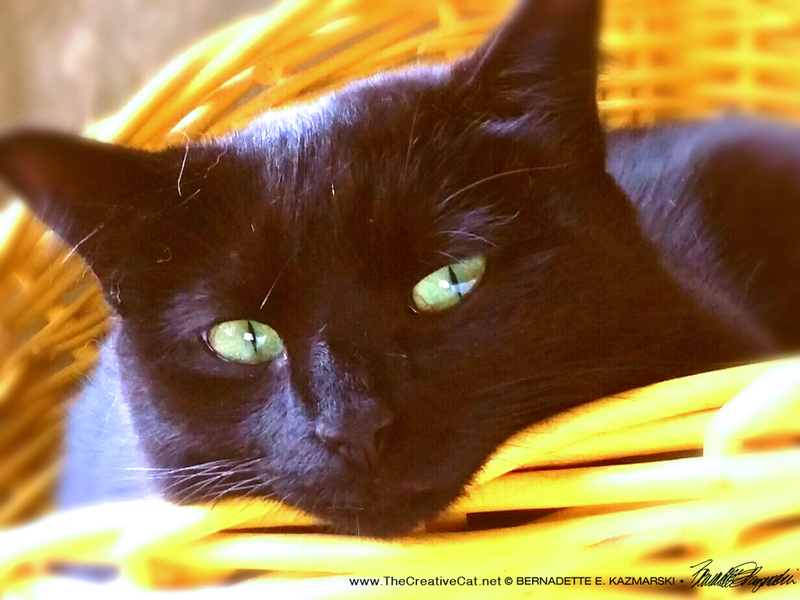 Hamlet was meant to inhabit the magic yellow basket. 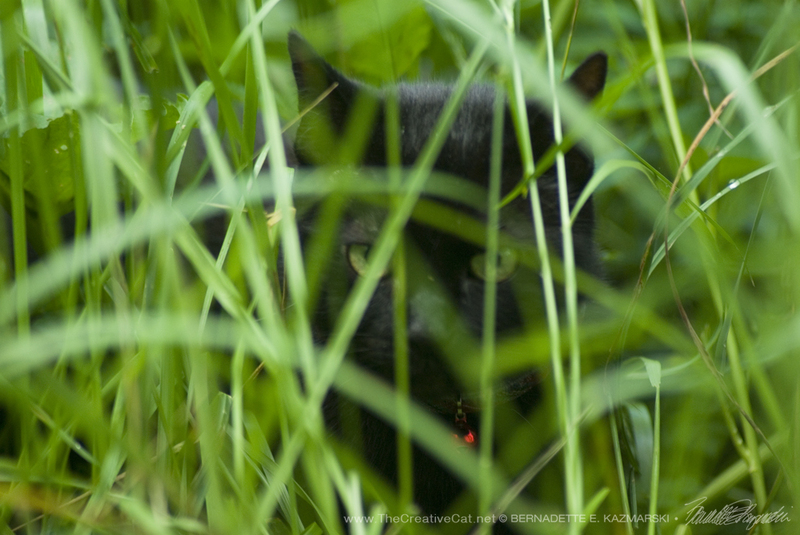 I featured this photo on Black Cat Appreciation Day in 2016. 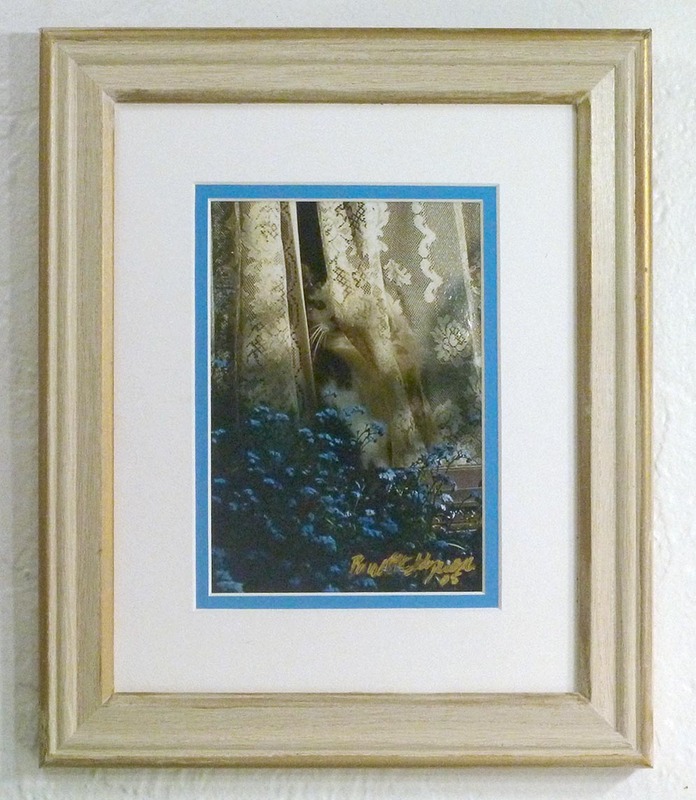 Print are framed with a white acid-free mat and a 1.25″ matte black solid wood frame. I do the framing in my studio. 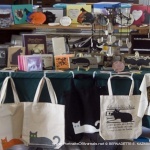 This is a sample, below. 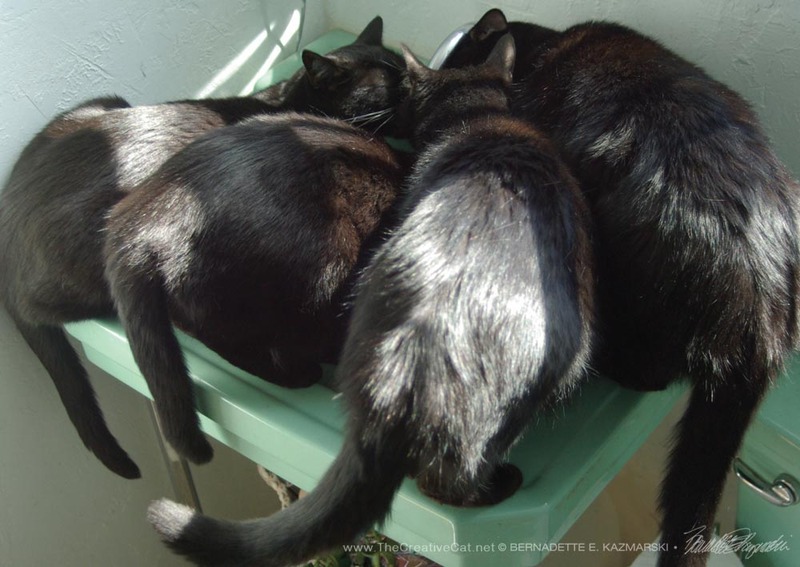 Four in a Bed, Feline Photo prints are made in archival inks on Epson Silky Photo Paper, Cold Press Digital Giclee Paper or Artist Canvas and available framed and unframed. 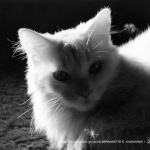 Mimi, Reading My Mind, Feline Photo prints are made in archival inks on Epson Silky Photo Paper, Cold Press Digital Giclee Paper or Artist Canvas and available framed and unframed. Mimi knew exactly the pose I had visualized, and here she is, as beautiful as I had imagined. Many of us joke that our animal companions can read our minds. In a very real way they can with their understanding of body language, and use of their senses to anticipate emotions by our scent if it’s fear or anger or another state of the human mind that puts us a bath of hormones. But without the same language as us can they truly understand our thoughts? And respond appropriately? And communicate in return? I tend to think in pictures, sometimes seeing images of the concepts I’m considering instead of putting words to thoughts, and I also visualize a lot. All the time. I’m always framing photos and visualizing a finished painting or sketch even if I have no intention of following through; it’s the background of every moment for me. There were many more, but these four were exactly four of the poses I had visualized. 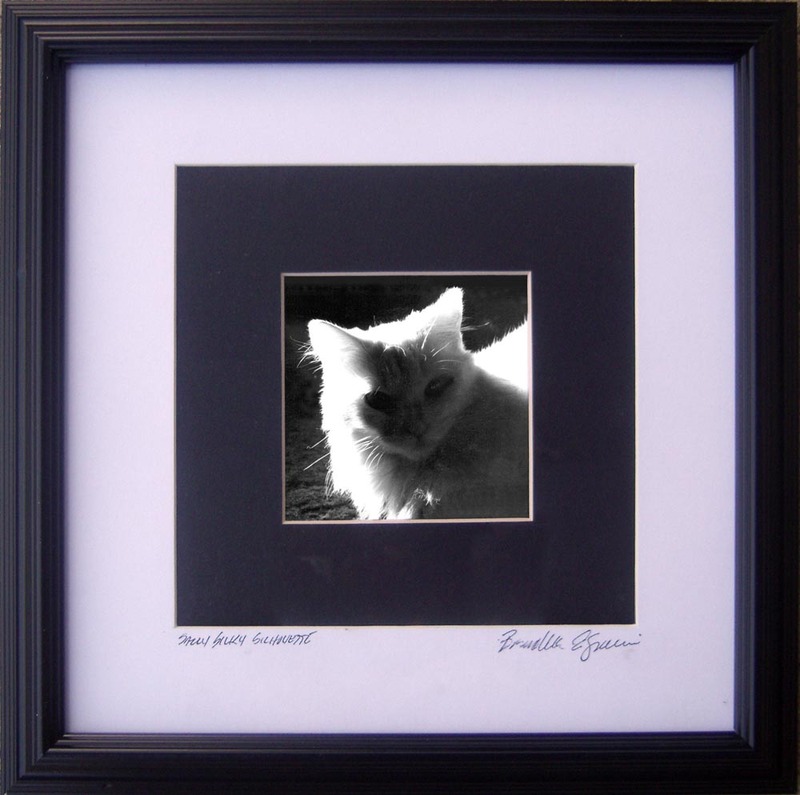 Office Cat Watches you, Feline Photo prints are made in archival inks on Epson Silky Photo Paper, Cold Press Digital Giclee Paper or Artist Canvas and available framed and unframed. 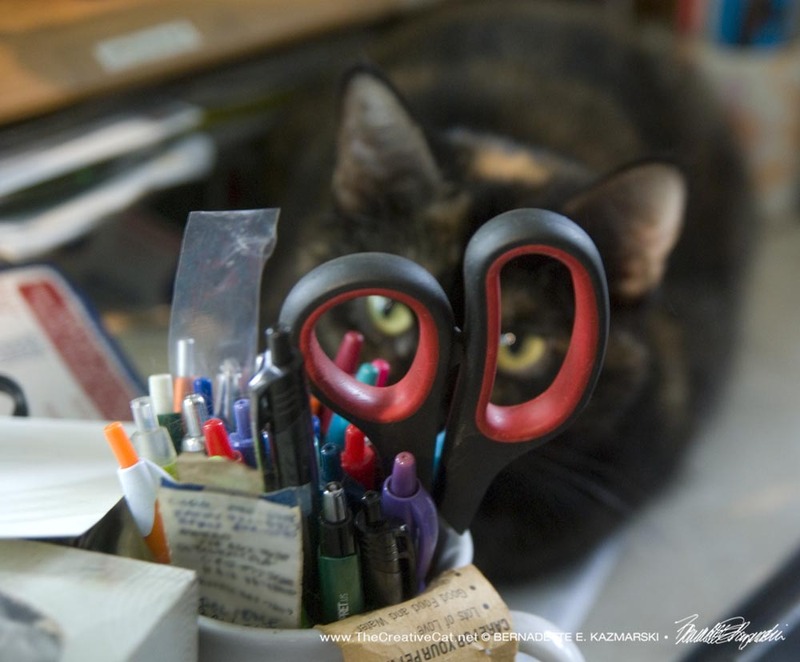 Office cat says I need to sit down and get to work. And that work is providing a lap for her. My that Sienna is getting bold, and what a talented model too, providing us all with this unique photo! I walked in the door and, as always, glanced around the room to locate all the cats who were there. Sweeping around past the desk I saw just this. What a photo! But I had no device at all handy, and if I walked too close to Sienna to get my smartphone she would get up and want pets. But I wanted the photo. 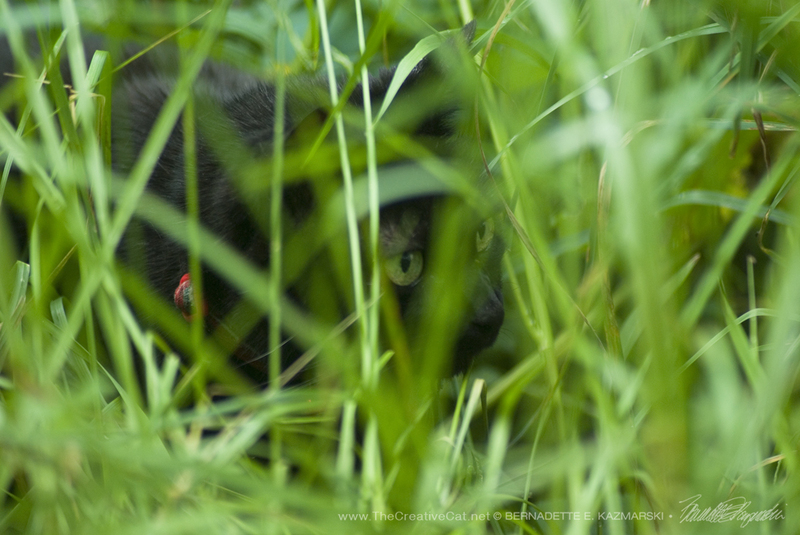 My DSLR was closer and she actually stayed there while I got it ready with the zoom lens though I expected her to be curious and come over. 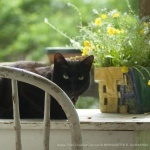 She looked right at me when I called her name and took two quick shots…and then she got up. But I got the photo. Sienna loves my desk and waits for me to come to work there, plus, in these extended warm days, she has two large open windows and a nice cross breeze. Such a nice kitty! 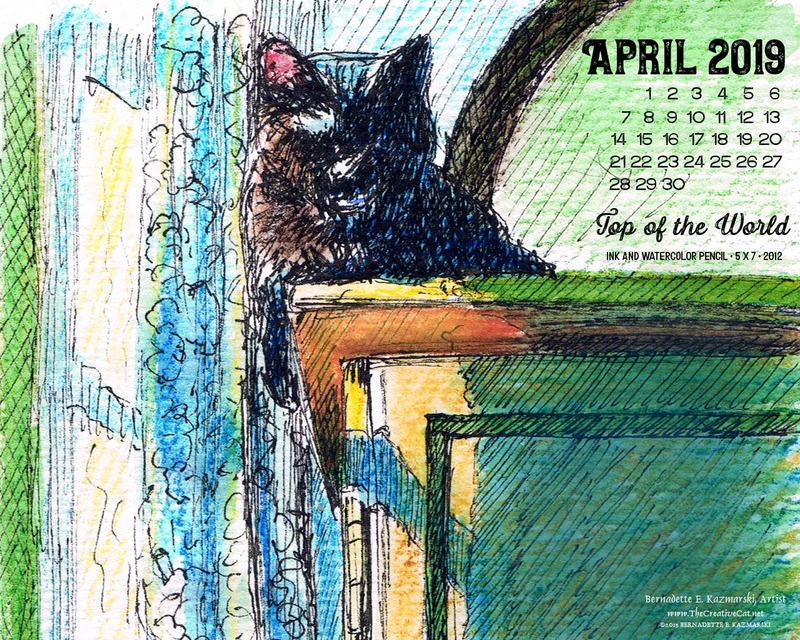 “Sophie Keeps an Eye on Things” prints are made in archival inks on Epson Silky Photo Paper, Cold Press Digital Giclee Paper or Artist Canvas. 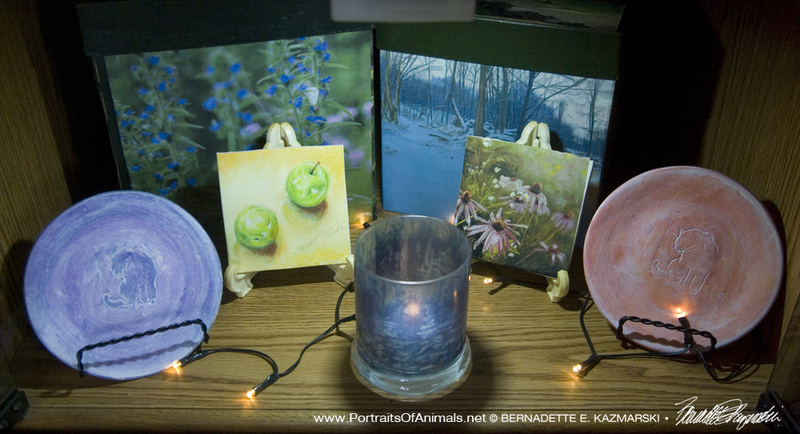 I have one framed print right now, as shown below, a 5″ x 7″ print with double mat in an 8″ x 10” frame. 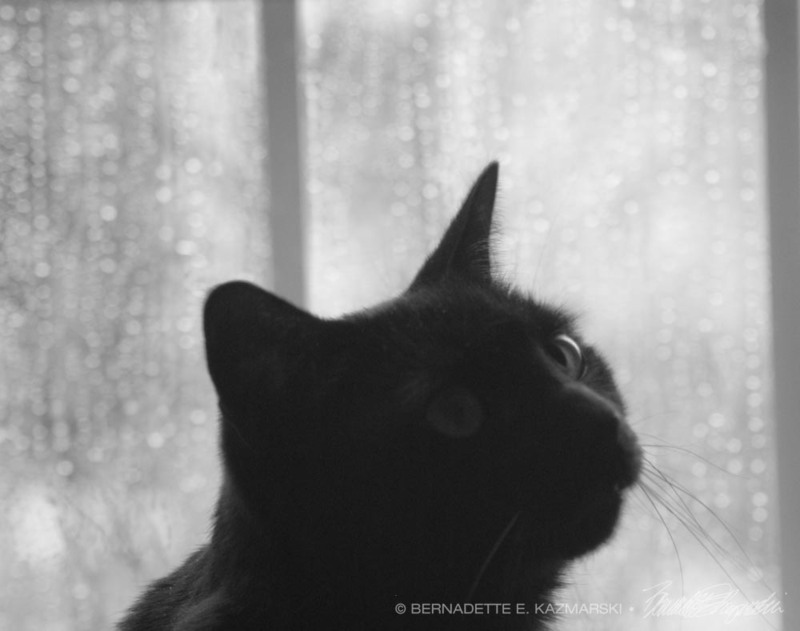 “Sophie Keeps an Eye on Things”, framed photo print. 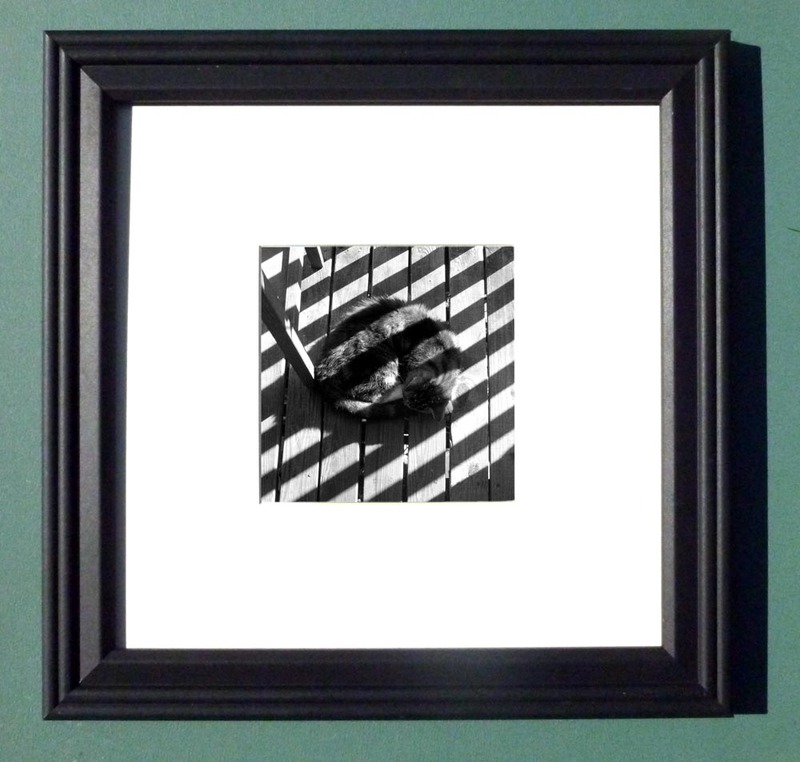 “Composition in Black and Green” prints are made in archival inks on Epson Silky Photo Paper, Cold Press Digital Giclee Paper or Artist Canvas. 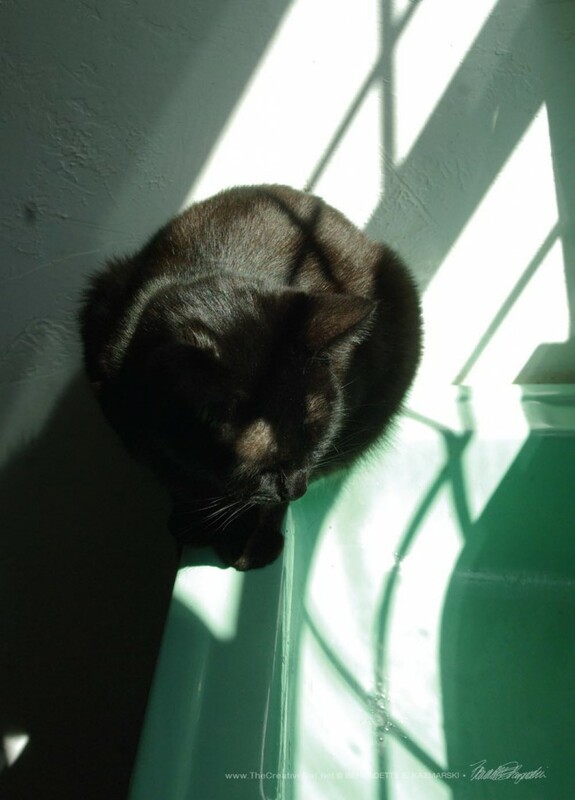 Jelly Bean enjoys being washed in spring sunlight as I enjoy how the pattern of the window muntins falls across the wall, the sink and him. What you can’t hear in this photo is Jelly Bean’s loud, vigorous purr as it echoes in the sink, truly an amazing percussive technique. This card is one of four designs in the set “Compositions in Black and Green”. 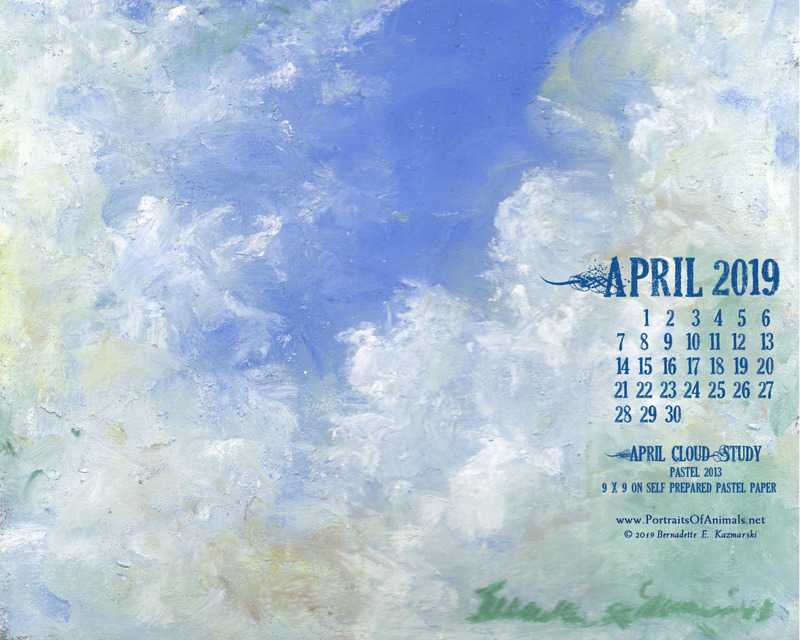 This very photo was the inspiration for this series of greeting cards, and the calendar of the same name, giving me a focus for the whole series of images. 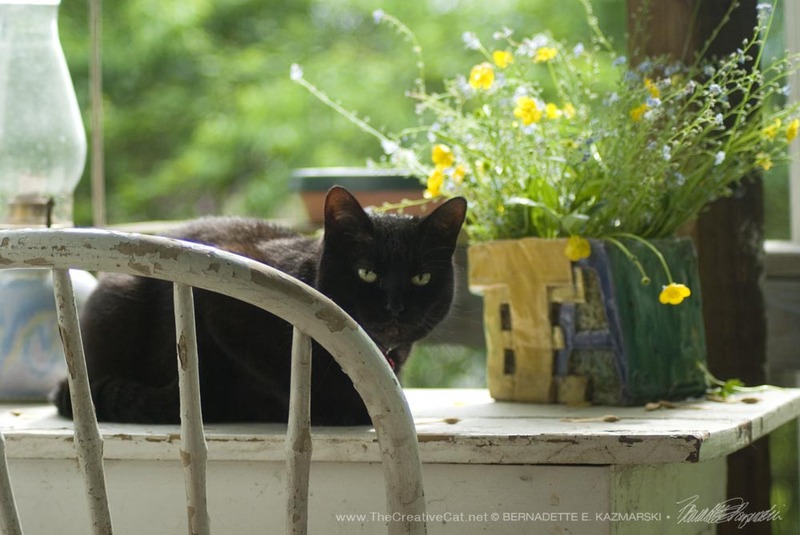 I loved the look of this image as soon as I saw Jelly Bean quietly resting on the edge of the sink, all its shades of green lit by the spring sunlight, Bean’s pleasantly rounded shape contrasting with geometric shadows of the window frame and muntins, and even before I photographed it the idea of a series of photos on this theme was born, including even the name. 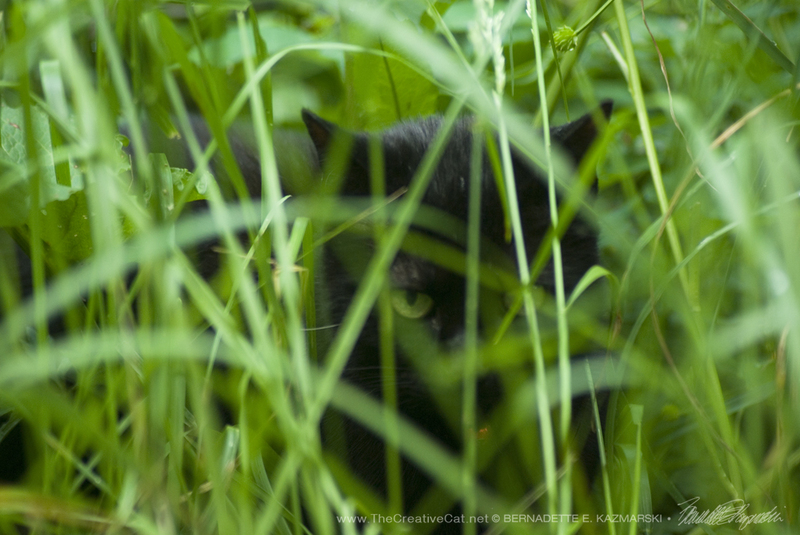 I already had a number of photos in the theme of black and green and knew I’d get more, and even to this day I am photographing more “compositions in black and green”. “Have a Drink With Family” prints are made in archival inks on Epson Silky Photo Paper, Cold Press Digital Giclee Paper or Artist Canvas. Especially if you’re the Parched Puddies having your daily drink in the mint green sink and the drink is water! 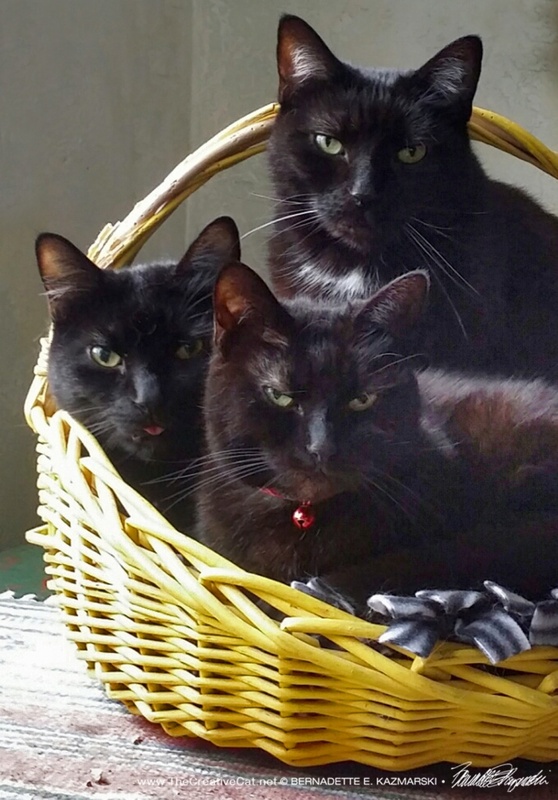 It’s Giuseppe, Jelly Bean, Mr. Sunshine and Mewsette, who were fostered in the “old” bathroom, before it was remodeled, and everything leaked. 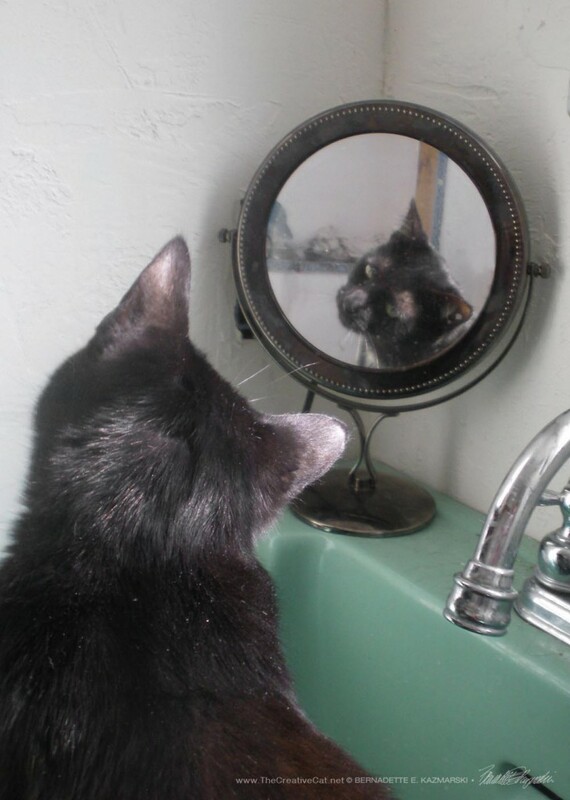 They grew up assuming you could drink out of any faucet, and still, years later, gather in the bathroom sink in twos, threes and fours, asking for a drink. I feature this photo each year at St. Patrick’s Day, though neither they nor I are Irish. 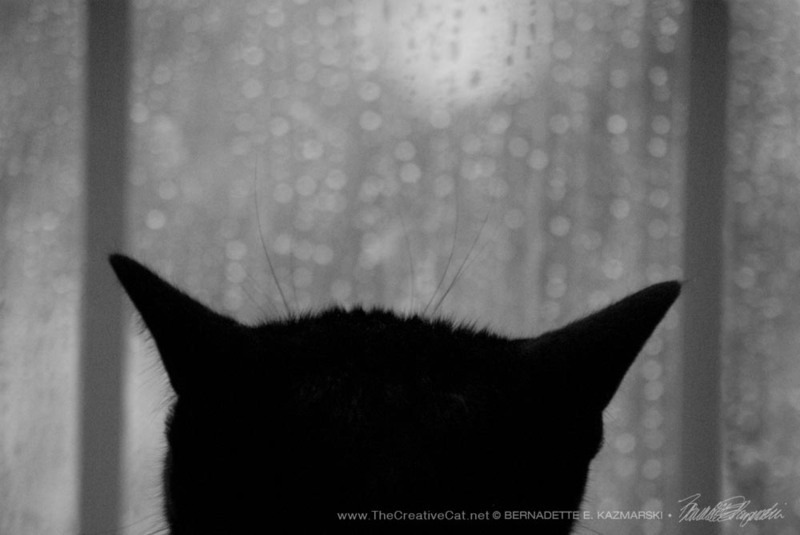 “Of the Rain and Giuseppe, Searching” prints are made in archival inks on Epson Silky Photo Paper, Cold Press Digital Giclee Paper or Artist Canvas. 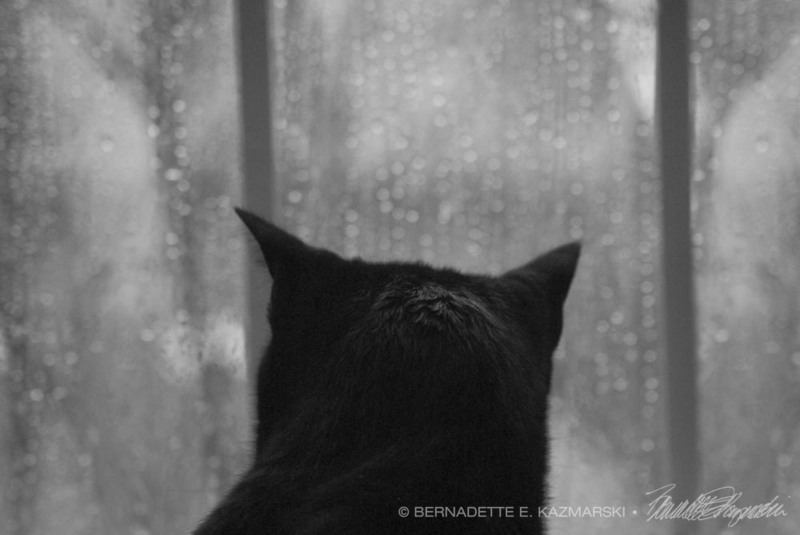 “Of the Rain and Giuseppe, Searching” is one of a series of photos I took of Giuseppe looking out the window at the rain and have always thought they’d be able to convey a variety of messages as photo cards, each of which can be found in my Feline Photo Greeting Cards gallery, and also attractive photo prints, which you can also find in my Cat Photos and Black and White galleries. “Of the Rain and Giuseppe, Dreaming” prints are made in archival inks on Epson Silky Photo Paper, Cold Press Digital Giclee Paper or Artist Canvas. “Of the Rain and Giuseppe” prints are made in archival inks on Epson Silky Photo Paper, Cold Press Digital Giclee Paper or Artist Canvas. 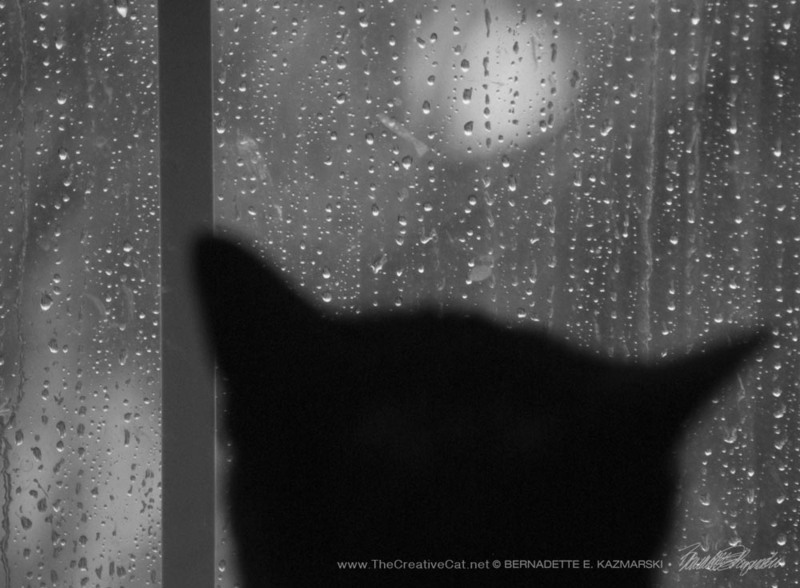 “Of the Rain and Giuseppe” is one of a series of photos I took of Giuseppe looking out the window at the rain and have always thought they’d be able to convey a variety of messages as photo cards, each of which can be found in my Feline Photo Greeting Cards gallery, and also attractive photo prints, which you can also find in my Cat Photos and Black and White galleries. 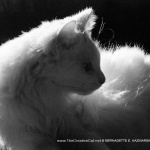 “I Have Vanquished the Blue Fuzzy” photo prints are made in archival inks on Epson Silky Photo Paper, Cold Press Digital Giclee Paper or Artist Canvas. 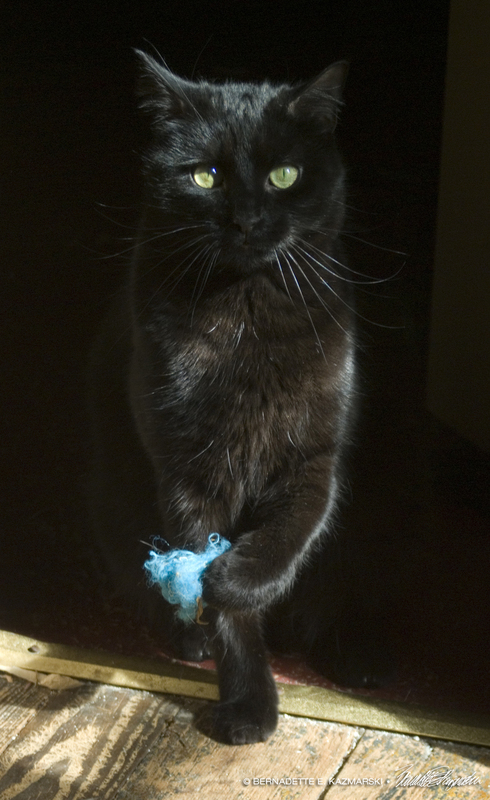 Mewsette emerges into the sun with the blue fuzzy she has chased around and around and around my room until finally she captured it and presents it to me. 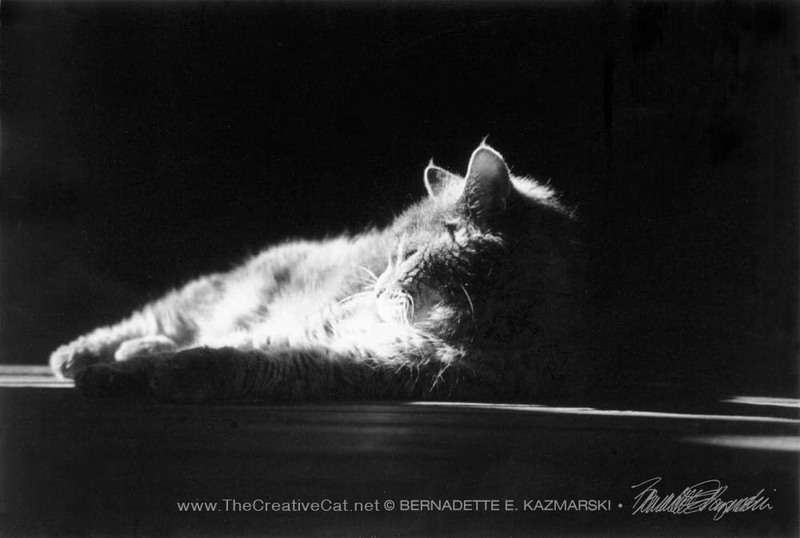 Sally Silhouette, Photo prints are made in archival inks on Epson Silky Photo Paper, Cold Press Digital Giclee Paper or Artist Canvas. 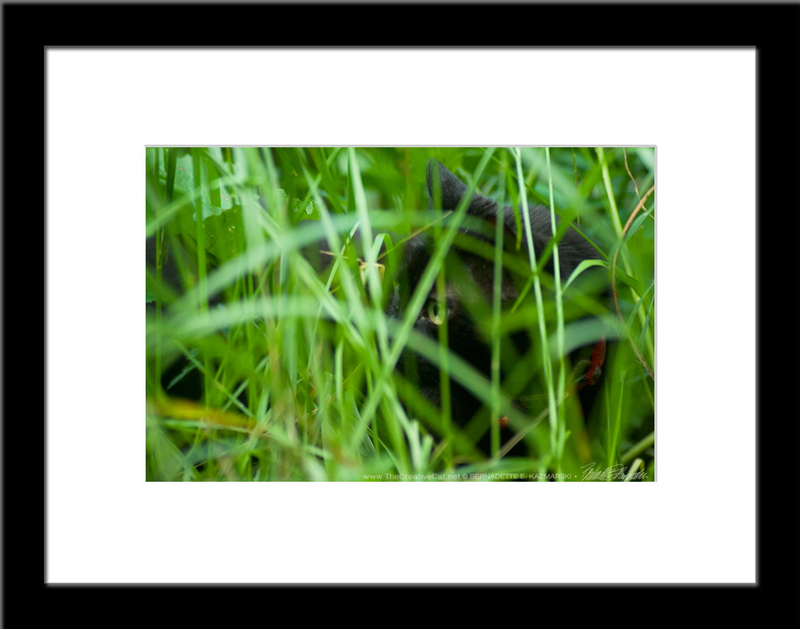 Mimi Hunting: Waiting, Photo prints are made in archival inks on Epson Silky Photo Paper, Cold Press Digital Giclee Paper or Artist Canvas and available framed and unframed. 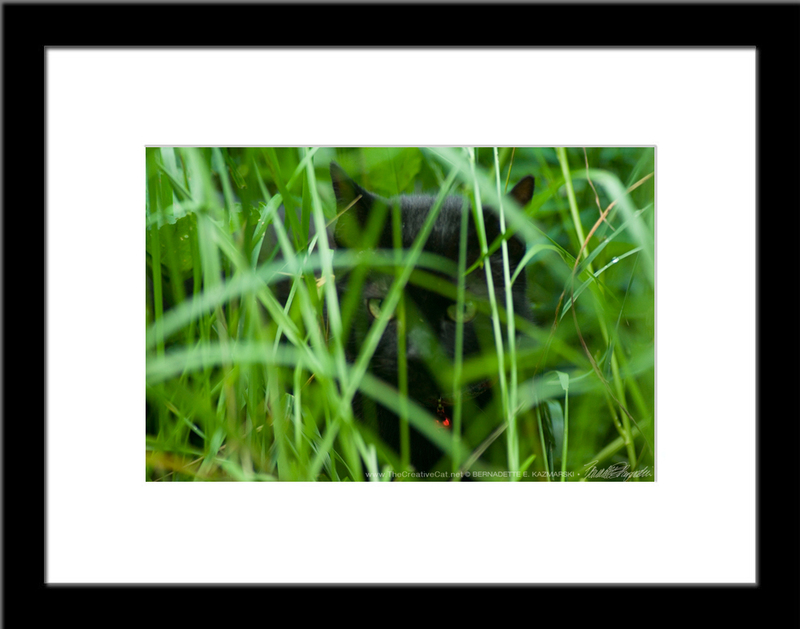 Mimi Hunting: Watching, Photo prints are made in archival inks on Epson Silky Photo Paper, Cold Press Digital Giclee Paper or Artist Canvas and available framed and unframed. 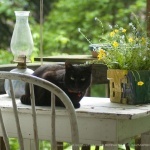 The Garden Bean, Feline Photo prints are made in archival inks on Epson Silky Photo Paper, Cold Press Digital Giclee Paper or Artist Canvas and available framed and unframed. 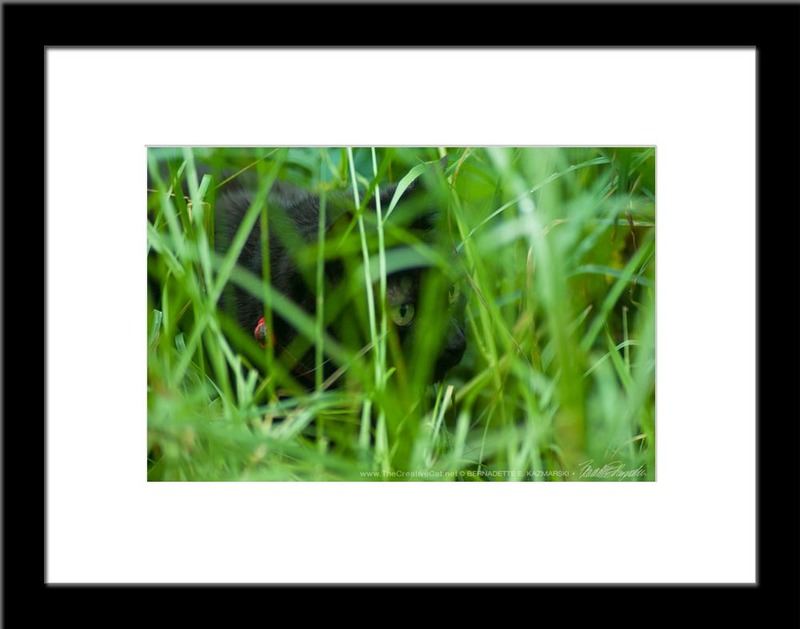 “Watching the World, Photo” prints are made in archival inks on Epson Silky Photo Paper, Cold Press Digital Giclee Paper or Artist Canvas. We all love my studio window, a big, old, battered metal-framed casement about 4′ x 4′ on the second floor looking out at the spruce, maple and river birch in the front of our house. I call it the “tree house” as we watch the weather and light change and spend time with all the tree-dwellers in the neighborhood above the street. 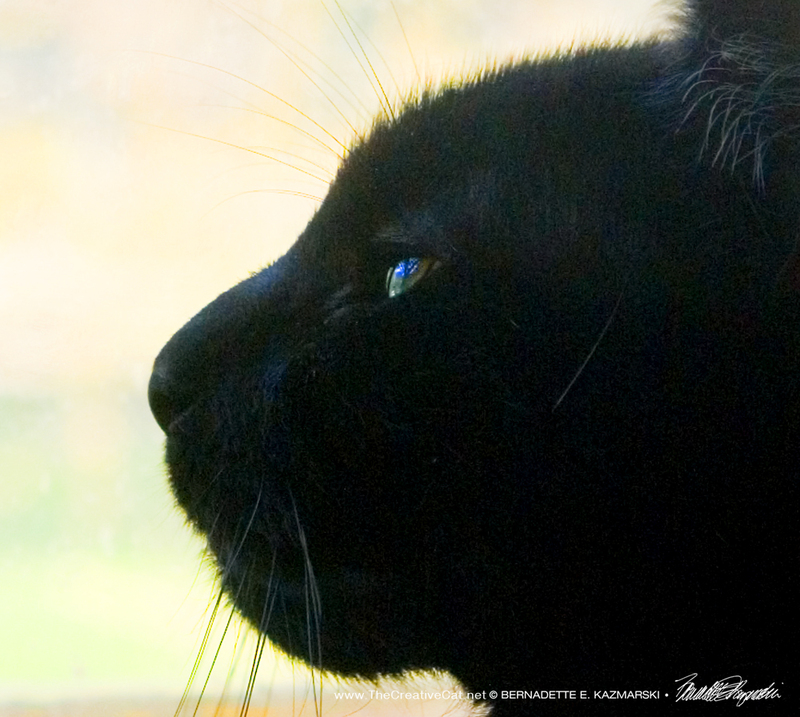 Giuseppe was watching Mr. Cardinal singing his spring song on this particular afternoon and I watched the light and images reflect on his eye and admiring his profile. 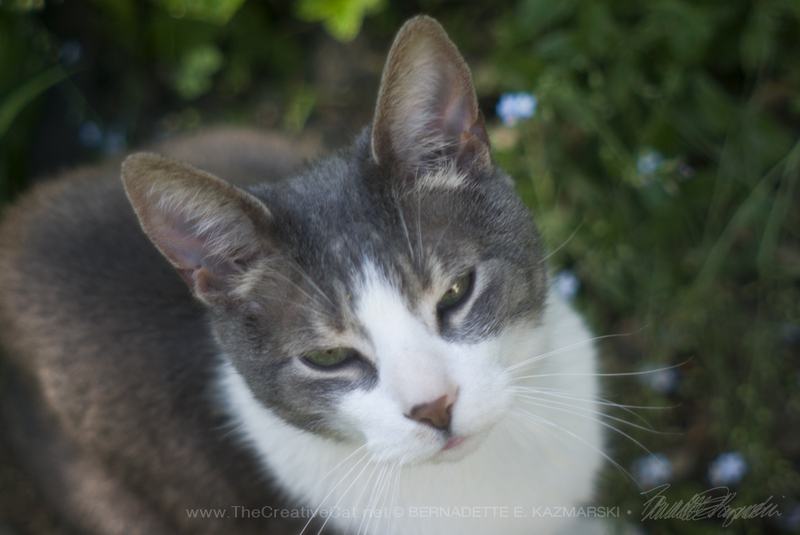 September Morning in the Garden, Feline Photo prints are made in archival inks on Epson Silky Photo Paper, Cold Press Digital Giclee Paper or Artist Canvas and available framed and unframed. What’s not to love? 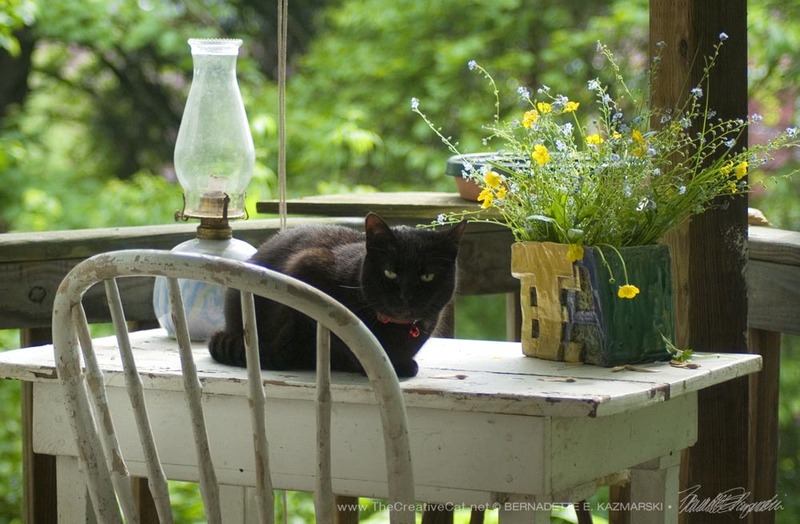 A tangled happy garden, a sleepy happy cat, lots of color and detail and sunlight. 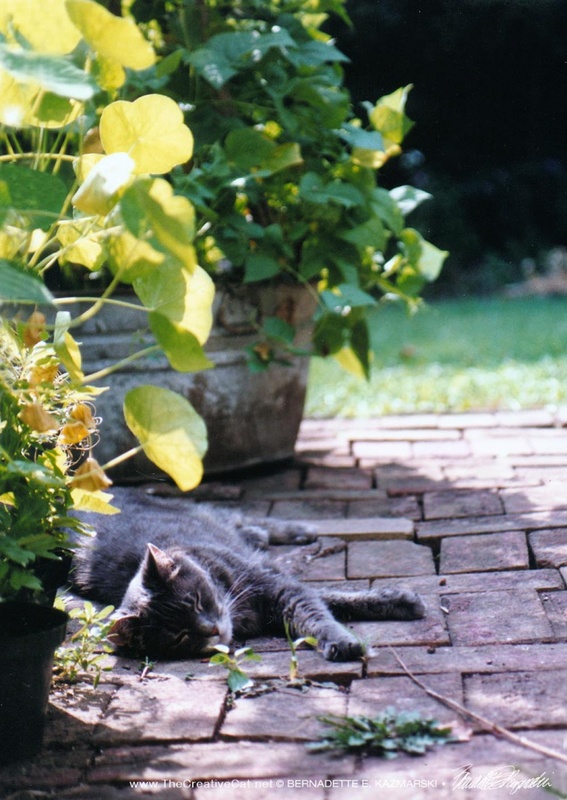 My garden kitty, Moses, enjoys her morning nap on the bricks in the shade of the beans, mid-morning in September. 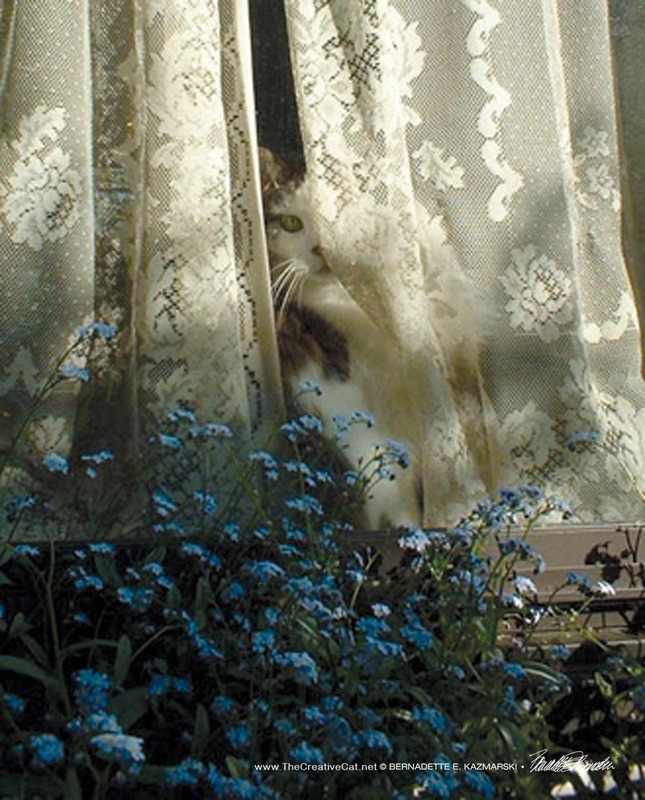 I’m fairly certain I took this in the late 90s, but it stands in for any sunny morning Moses and I enjoyed in the garden. Remembering Cookie and Namir this morning while Mimi and Mewsette and I were out hanging laundry (well, I was hanging laundry), I thought I’d bring out this photo. 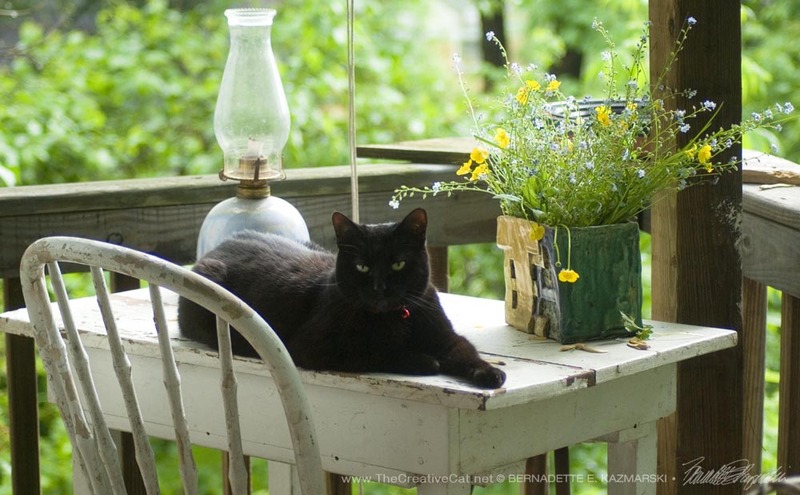 I think of all the cats who shared my garden, and the fact that Mimi and Moses were probably acquainted from Mimi visiting the garden and patio when the basement door was open, though they never lived in the house together. 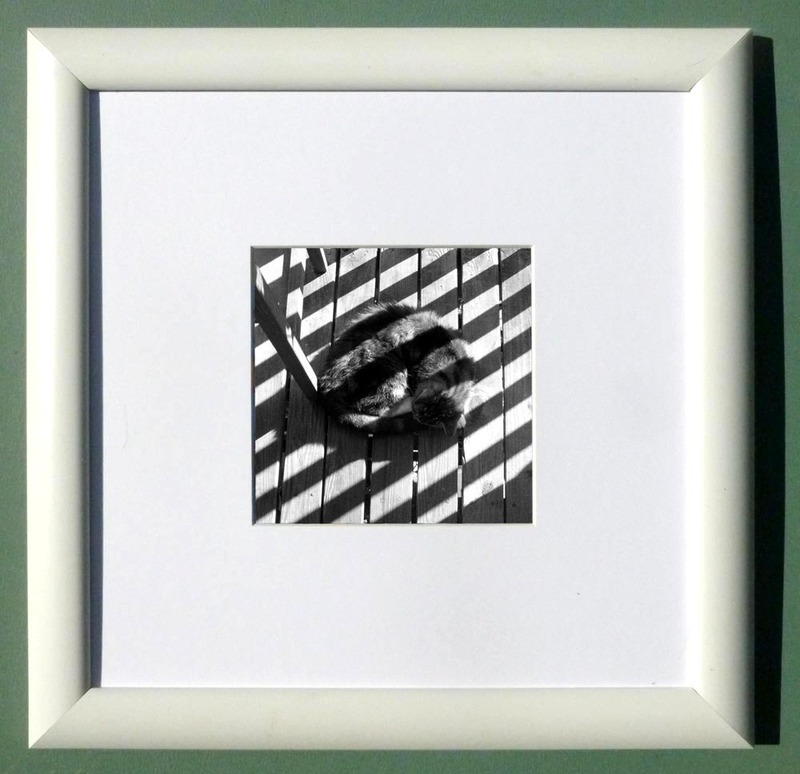 Bella’s Basket of Dreams, Feline Photo prints are made in archival inks on Epson Silky Photo Paper, Cold Press Digital Giclee Paper or Artist Canvas and available framed and unframed. 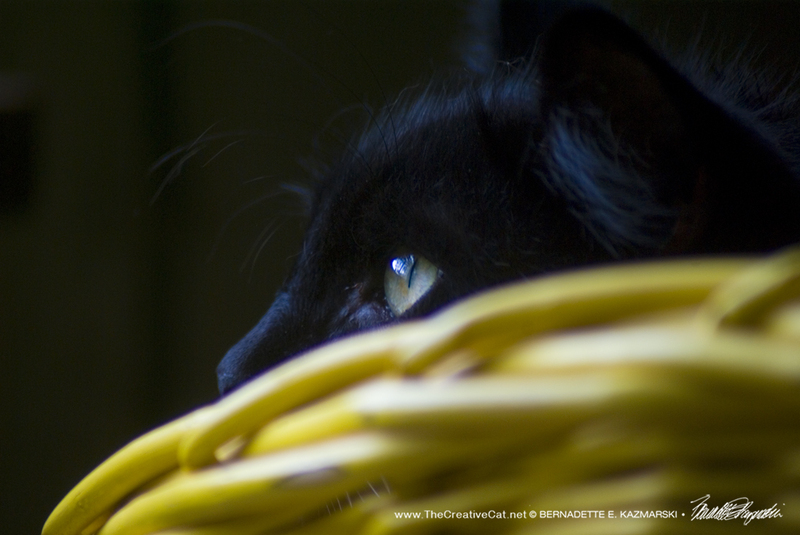 Bella spends some time in the basket almost every day, and I can hardly pass up the opportunity to photograph her. How could I pass up such beauty? I’m fairly certain she knows the effect she has on me, judging by the purr-fect poses she finds. Surprise! 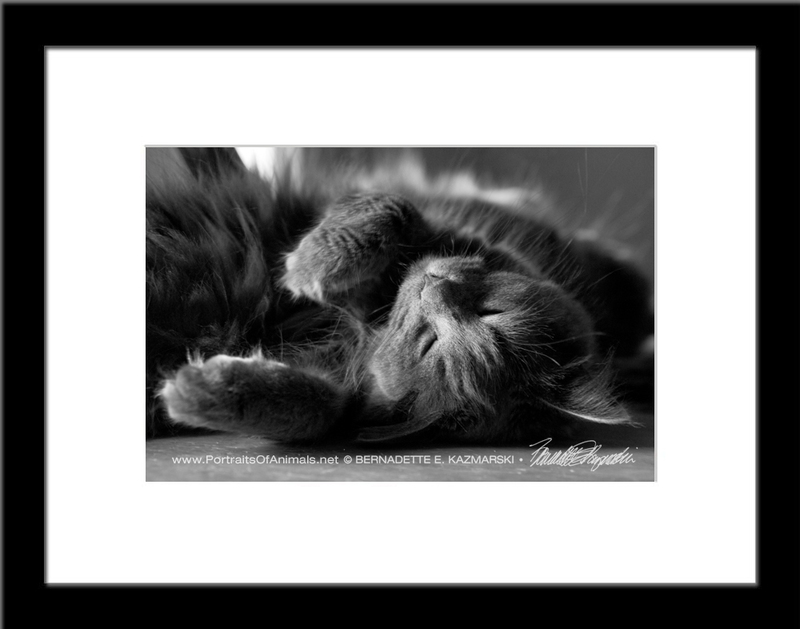 Feline Photo prints are made in archival inks on Epson Silky Photo Paper, Cold Press Digital Giclee Paper or Artist Canvas and available framed and unframed. 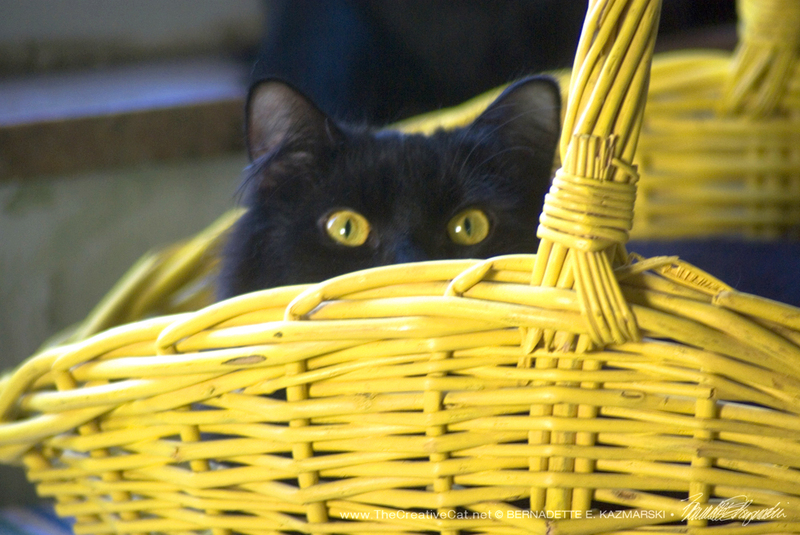 Basil must have thought the yellow basket was a gift for him because he owned it from the day it came into the house, which was the day I was running errands and saw it…atop someone’s trash pile. 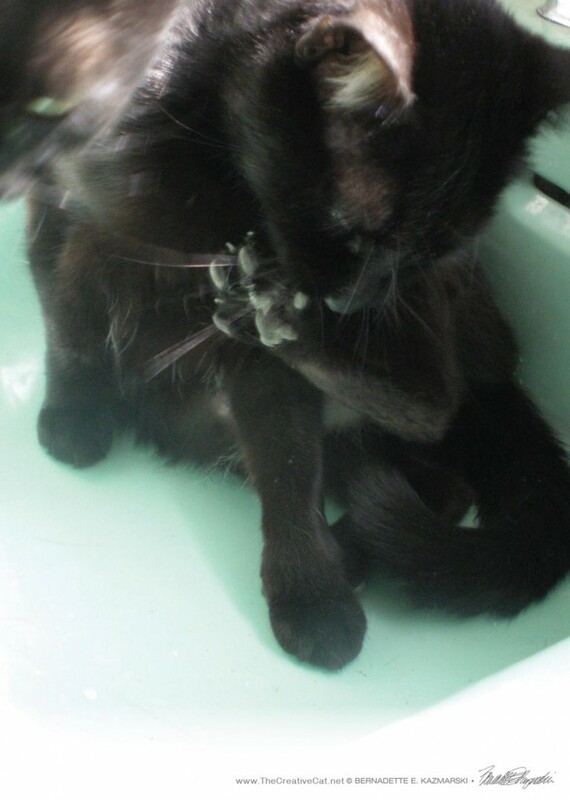 I sprayed it down and rinsed it in the basement and let it air dry, then brought it up to the magic basket spot, and Basil was immediately IN THE BASKET, looking totally cute, big, long, white whisker and all. 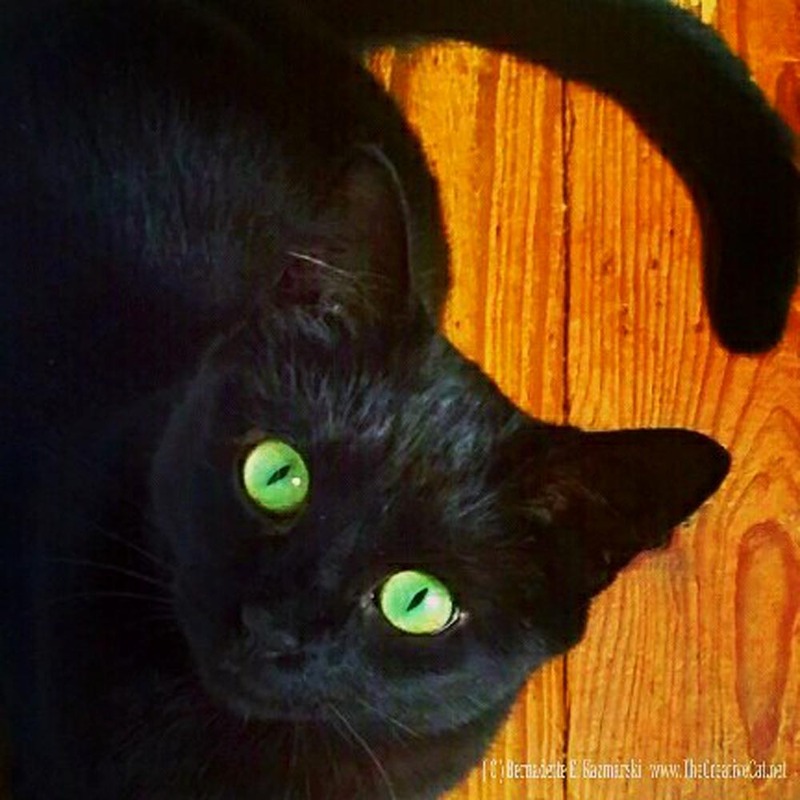 But especially his glowing amber eyes! 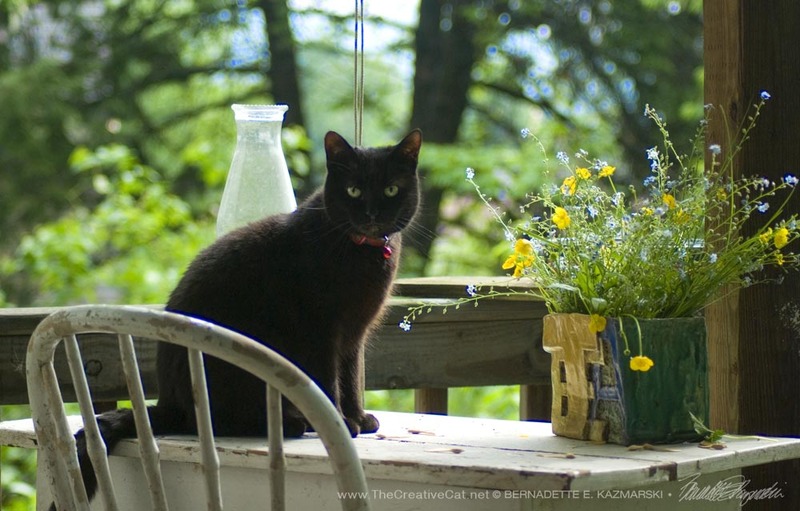 We had some glowing sunny days and I hardly photographed anything but Basil and his amber eyes in the basket including the one I’d first seen of him with his round eyes looking over the edge of the basket. 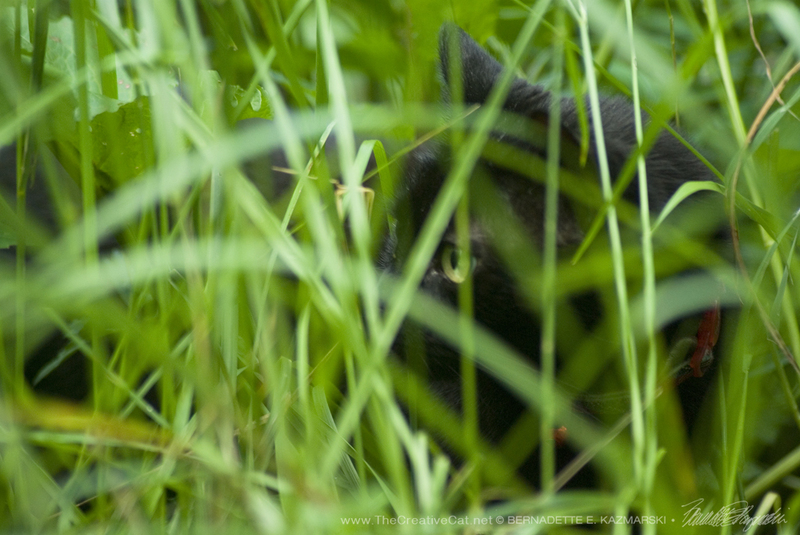 Tortie Camouflage, Feline Photo prints are made in archival inks on Epson Silky Photo Paper, Cold Press Digital Giclee Paper or Artist Canvas and available framed and unframed. 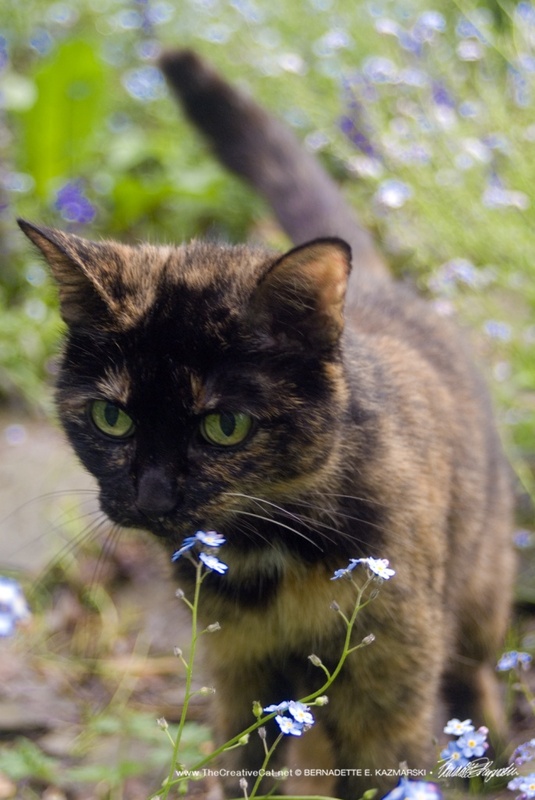 Tortoishell cats can be camouflaged against many backgrounds with all their irregular speckles and dots. 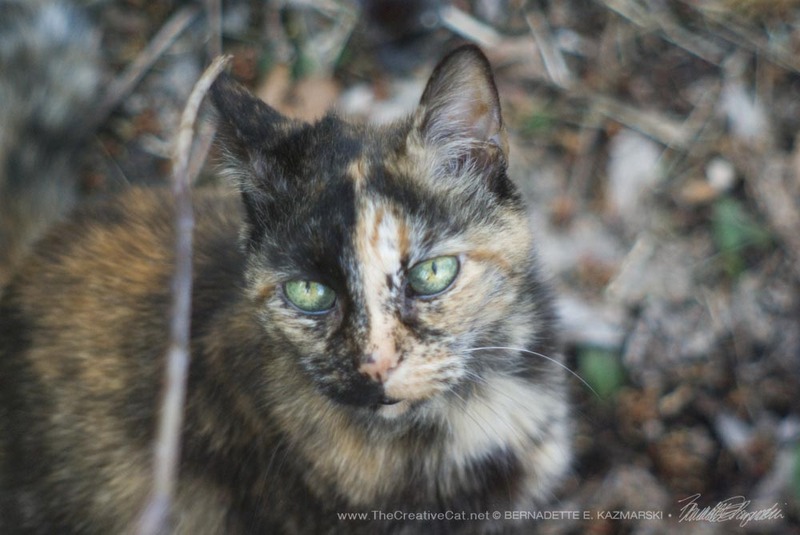 This photo of Cookie taken in the spring of 2010 truly shows her ability to blend into her background as her orange and tan blend with last year’s leaves and her green eyes blend with the spring’s new growth. I could not love her more.